If you need a skip bin hire in Brisbane at a fair price then you’ve come to the right place. Lightning Skips is a family owned and operated business in Brisbane and surrounding suburbs. Our Skip Bins range in size from 3 to 8 cubic metres at very competitive prices. We always put our customers first and make sure we deliver on our promises; our reputation insists on it. **From time of order confirmation by Lightning Skips to you or your company receiving the skip. 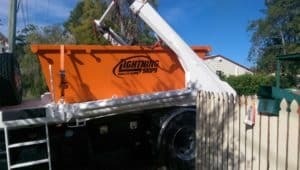 If you’re looking for reliable skip hire in the Brisbane area from a friendly and professional team, look no further than Lightning Skips. We are available to deliver assistance and industry knowledge to best help your requirements, be that with pricing, skip size, the ideal methods to handle certain types of waste, and more. Call 0472 975 477 and get a quote today! View our competitive pricing and book your skip today! If you are not sure which areas we deliver skip bins to in Brisbane, then check this page out for all the info of where we deliver skip bins. We’ll take a lot of your waste in our skip bin hire Brisbane, but we don’t take everything – read more about what we can and can’t take away. Find out the right size skip bin for you. If unsure call anytime. To book any of our skips or to find out more about our services, please call 0472 975 477.